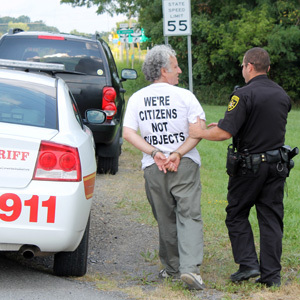 WATKINS GLEN—The Schuyler County Sheriff's Department arrested three area residents for trespassing on U.S. Salt property while protesting the proposed Inergy liquid gas storage and transfer facility, Thursday, Sept. 6. Inergy LLC, which owns U.S. Salt, wants to build a $40 million storage and transfer facility in Reading, on the western side of Seneca Lake. The company proposes storing the gas in existing underground salt caverns. The New York State Department of Environmental Conservation is reviewing the project. Nearly a dozen people were protesting at the Route 14 entrance to the U.S. Salt property. Hector resident Jeremy Alderson and Burdett resident Gary Judson were chained to the entrance from 10 a.m. to 12:15 p.m. Sheriff Bill Yessman arrived at the protest at noon and told the people that they were on U.S. Salt's private property and blocking the entrance. Yessman gave the protesters a 15 minute warning saying anyone still in front of the fence would be arrested. Everyone except Judson, Alderson, and Starkey resident Susan Walker relocated to the edge of the road. After the 15 minute warning, all three were arrested. Yessman explained the three were in violation of trespassing on private land. He added all three would be taken to the county jail, issued an appearance ticket for a later date, and released. Before the authorities arrived, Judson explained they were protesting because of the potential dangers to the lake, land, community, and the tourism due to the project. Concerns include increased truck traffic through the village, the brine ponds contaminating Seneca Lake, and air pollution. Judson said his plan was to stay until he was arrested.